Pectus excavatum is an abnormal inward curve to the breastbone. It may be visible at birth. Growth through adolescence can make the indentation of the chest more apparent. It may continue until it has created a bowl-shape dent in the center of the chest. Severe forms can create extra pressure on the heart and lungs. This can lead to more serious health problems like shortness of breath and limited physical activities. Complications from pectus excavatum tend to increase with age due to bone growth and a decrease in the flexibility of the bones. Pectus excavatum is characterized by an indentation in the front of the chest wall. It may be mild or deep enough to form a bowl shape. A person with this condition may not have any symptoms during childhood. But as the person grows into an adolescent, he may have symptoms because of of a more pronounced indentation in the chest wall. Your doctor will often be able to diagnose pectus excavatum after a physical exam. CT scan —a type of x-ray that uses a computer to make pictures of structures inside the chest. This is done to determine if the heart is squashed in the chest. Pulmonary function test —a group of tests done to assess breathing ability. They will assess if your lungs have any difficulty moving adequate amounts of air. This surgery involves incisions in the front of the chest. The surgeon will be able to see your breastbone. 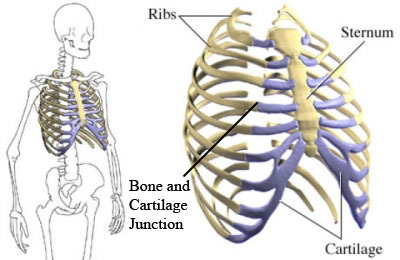 Some cartilage will be removed from your breastbone and nearby ribs. The surgeon will place the breastbone in its proper position. A metal strut and mesh will be used to support the new position. The metal strut may come out in 6-12 months. Small incisions are made on either side of the chest. The surgeon will place a metal bar through the incisions and secure it under the breastbone. This bar will push the breastbone into a better position. This bar will remain in the chest for 2-3 years. This will allow the chest time to remodel itself. Your doctor or physical therapist may recommend exercises or a rehabilitation program. Certain exercises and postural positions may decrease the appearance of mild pectus excavatum. Goretsky MJ, Kelly RE Jr, Croitoru D, Nuss D. Chest wall anomalies: pectus excavatum and pectus carinatum. Adolesc Med Clin. 2004;15(3):455-471. Jaroszewski D, Notrica D, McMahon L, Steidley E, Descahmps C. Current management of pectus excavatum: a review and update of therapy and treatment recommendations. J Am Board Fam Med. 2010;23(2):230. Mavanur A, Hight DW. Pectus excavatum and carinatum: new concepts in the correction of congenital chest wall deformities in the pediatric age group. Conn Med. 2008;72(1):5-11. Pectus excavatum. EBSCO DynaMed Plus website. Available at: http://www.dynamed.com/topics/dmp~AN~T114889/Pectus-excavatum . Updated February 19, 2016. Accessed November 13, 2017. Pectus excavatum. McMaster Children’s Hospital website. Available at: http://www.hamiltonhealthsciences.ca/documents/Patient%20Education/PectusExacavatum-lw.pdf. Accessed November 13, 2017.